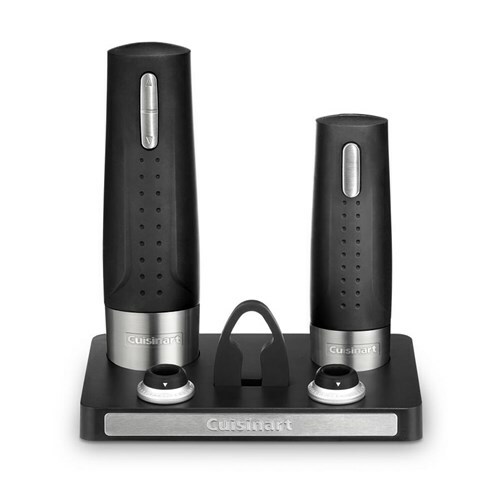 The Cuisinart Wine Center - Opener/Preserver offers everything a wine lover needs to enjoy wine. The electric opener quickly and effortlessly uncorks a bottle, while the electric preserver maintains the freshness of any wine that remains. The powerful opener uncorks up to 50 synthetic and natural corks on one charge, and includes a button to release the cork off the screw. It's easy to save any remaining wine with the electric preserver - it creates an airtight vacuum, letting wine maintain its flavor and freshness for days. The handsets are rubberized so they're nonslip and easy to grip. The charging base doubles as a storage center, so the charger and preserver remain easy to access. A foil cutter ensures clean openings and drip-free pours, and two rubber stoppers are included. The Cuisinart Electric Wine Opener has many exciting features for users of all types. You can extend the lifetime of your Cuisinart Electric Wine Opener with the purchase of a FactoryOutletStore Factory Protection Plan. 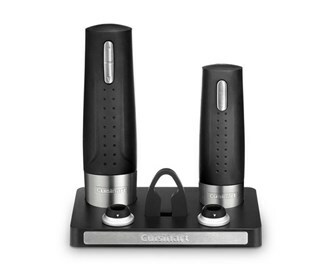 See the Cuisinart Electric Wine Opener gallery images above for more product views. The Cuisinart Electric Wine Opener is sold as a Brand New Unopened Item.